Living in a global world with internet access, one does not have to travel to a place to know its favorite restaurants, best place to drink a cup of coffee or its landmarks. 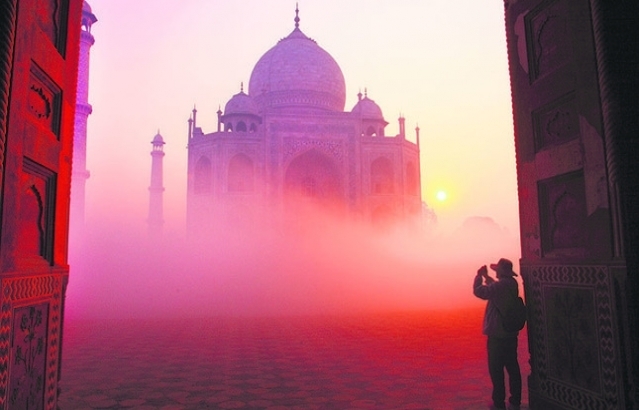 Imagining India, the first image to pop up in almost everybody's minds is the Taj Mahal, the jewel of India, a requiem of a man to the eternal soul of his wife. To most people's shock, the Taj Mahal is not located in New Delhi, the capital city of the country with a population of over 1 billion, but in Agra, another big and important city of India that is sometimes overshadowed by the glory of the Taj. The city of Agra has more to offer to its visitors other than the Taj Mahal; the city is in possession of numerous artworks in the galleries and museums which makes it all the more popular as a tourist destination.Agra is a three-hour drive from Delhi. I'm not going to go into the topic of traffic and driving in India since those who visited the country know that already. But don't be surprised if you see someone making a U-turn on a highway. Upon entering Agra, the same urban bustle meets you again. The nearly 1-kilometer walkway leading to the Taj Mahal, an imposing stone road crossing through the surrounding forest, is quite pleasant. One can close their eyes and imagine the stately elephant cars passing around there back in the day. You may come across monkeys sitting on the roadside looking at you. Monkeys are a familiar sight in India, though people coming from countries where monkeys are not a part of wildlife might find it exciting and surprising to see monkeys on the roads. India is a rather green country overall. So, its interaction with nature is of a quite different character. Agra is located on the banks of the Yamuna River. It is one of the most densely populated places in the state of Uttar Pradesh. There is also a sizable Muslim population in this region. Muslims in India, which has a rich ethnic diversity with 36 local languages being spoken, make up approximately 20 percent of the population. Agra is known for its prominence during the Mughal rule. 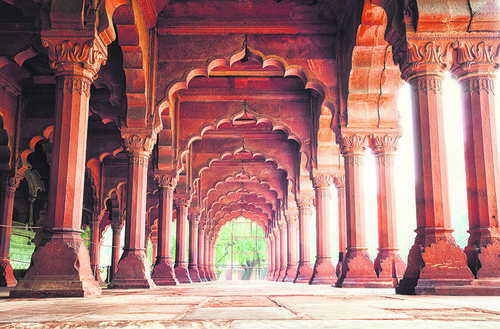 It was the second capital city of the Mughal Empire after Fatehpur Sikri. 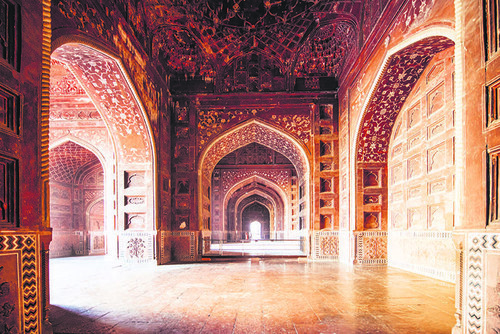 The Agra Fort, Taj Mahal and Fatehpur Sikri in this region are included on the UNESCO World Heritage List. The majestic Taj is in fact the last resting place, the tomb, of Mumtaz Mahal, the wife of Shah Jahan who built India's famous landmark in memory of his wife. The Taj Mahal is a complex which also contains a mosque rather than a single building. Everything on its long and wide courtyard imparts an elaborate symmetry. The marbles and the hand-workmanship are still resplendent. Taj Mahal has three gates on the west, south and east sides. The road leading to the monument is embellished with ponds and gardens. The story of Taj Mahal is about the Mughal emperor Shah Jahan and his tender love of his wife Mumtaz Mahal, who died while giving birth to their 14th child. Shah Jahan wanted to build a monument in memory of his late wife. The Taj Mahal took approximately 20 years to complete. 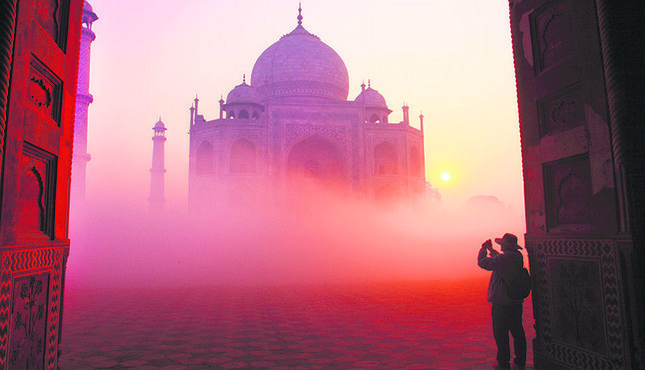 When it was first constructed, the great Taj was sitting on the banks of the Yamuna River. Indeed, drawings made until the 20th century show the waters of the river pounding against the monument, with little white boats rowing around. A series of dams built later diverted the waters of the river to another riverbed. The river is now 50 meters away from the Taj Mahal. 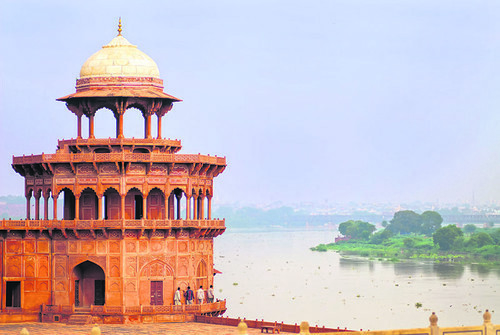 On the other side of the Yamuna River stands Shah Jahan's palace, which is also called the Agra Fort. The palace had a viewing platform so that Shah Jahan could gaze at the Taj Mahal from where he sat. Agra Fort is situated at a distance of 2 kilometers from the Taj Mahal. Aurangzeb, the third son of Shah Jahan and Mumtaz Mahal, took the throne and put his father in prison. After being imprisoned after a life in a huge palace, Shah Jahan had only one window to view the Taj Mahal. When he died after spending his final years in imprisonment, Shah Jahan was buried next to the cenotaph of Mumtaz in Taj Mahal. Today, nearly 5 million people visit the Taj Mahal every year. When one sees this monument, many grand mosques pale in comparison at once and one cannot help but gaze at its fascinating beauty for hours on end.